Share a Lifetime of Adventure! The One Gift that Truly Gives for a Lifetime! What is a Legacy Hunting or Fishing License? The Legacy Hunting or Fishing License is issued only to an individual who is younger than two years of age. It is valid for the lifetime of the license holder, regardless of any change in that person’s status as a resident or non-resident. 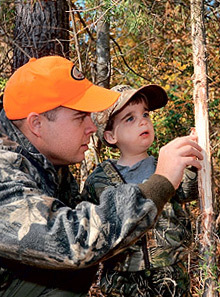 The Legacy Hunting License is valid until the individual’s twelfth birthday. Upon proof of completion of a hunter education course or equivalent, this license is transferable to a lifetime hunting license at no additional charge. How Much Does a Legacy Hunting or Fishing License Cost? The cost is $125 for resident children and $250 for nonresident children. How Can I Get a Legacy Hunting or Fishing License? The Legacy Hunting or Fishing License application is available by accessing the link below or contacting Customer Service at 1-866-721-6911.